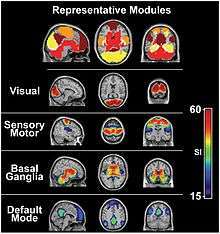 The visual system and the somatosensory system are active even during resting state fMRI. The sensory nervous system is a part of the nervous system responsible for processing sensory information. A sensory system consists of sensory receptors, neural pathways, and parts of the brain involved in sensory perception. Commonly recognized sensory systems are those for vision, auditory (hearing), somatic sensation (touch), gustatory (taste), olfaction (smell) and vestibular (balance/movement). In short, senses are transducers from the physical world to the realm of the mind where we interpret the information, creating our perception of the world around us. The receptive field is the specific part of the world to which a receptor organ and receptor cells respond. For instance, the part of the world an eye can see, is its receptive field; the light that each rod or cone can see, is its receptive field. Receptive fields have been identified for the visual system, auditory system and somatosensory system, so far. 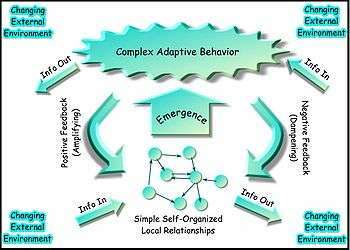 Sensory systems code for four aspects of a stimulus; type (modality), intensity, location, and duration. Arrival time of a sound pulse and phase differences of continuous sound are used for localization of sound sources. Certain receptors are sensitive to certain types of stimuli (for example, different mechanoreceptors respond best to different kinds of touch stimuli, like sharp or blunt objects). Receptors send impulses in certain patterns to send information about the intensity of a stimulus (for example, how loud a sound is). The location of the receptor that is stimulated gives the brain information about the location of the stimulus (for example, stimulating a mechanoreceptor in a finger will send information to the brain about that finger). The duration of the stimulus (how long it lasts) is conveyed by firing patterns of receptors. These impulses are transmitted to the brain through afferent neurons. While there is debate among neurologists as to the specific number of senses due to differing definitions of what constitutes a sense, Gautama Buddha and Aristotle classified five ‘traditional’ human senses which have become universally accepted: touch, taste, smell, sight, and hearing. Other senses that have been well-accepted in most mammals, including humans, include nociception, equilibrioception, kinaesthesia, and thermoception. Furthermore, some non-human animals have been shown to possess alternate senses, including magnetoception and electroreception. Photoreceptors are capable of phototransduction, a process which converts light (electromagnetic radiation) into, among other types of energy, a membrane potential. There are three primary types of photoreceptors: Cones are photoreceptors which respond significantly to color. In humans the three different types of cones correspond with a primary response to short wavelength (blue), medium wavelength (green), and long wavelength (yellow/red). Rods are photoreceptors which are very sensitive to the intensity of light, allowing for vision in dim lighting. The concentrations and ratio of rods to cones is strongly correlated with whether an animal is diurnal or nocturnal. In humans rods outnumber cones by approximately 20:1, while in nocturnal animals, such as the tawny owl, the ratio is closer to 1000:1. Ganglion Cells reside in the adrenal medulla and retina where they are involved in the sympathetic response. Of the ~1.3 million ganglion cells present in the retina, 1-2% are believed to be photosensitive. All stimuli received by the receptors listed above are transduced to an action potential, which is carried along one or more afferent neurons towards a specific area of the brain. While the term sensory cortex is often used informally to refer to the somatosensory cortex, the term more accurately refers to the multiple areas of the brain at which senses are received to be processed. For the five traditional senses in humans, this includes the primary and secondary cortexes of the different senses: the somatosensory cortex, the visual cortex, the auditory cortex, the primary olfactory cortex, and the gustatory cortex. Located in the parietal lobe, the somatosensory cortex is the primary receptive area for the sense of touch. This cortex is further divided into Brodmann areas 1, 2, and 3. Brodmann area 3 is considered the primary processing center of the somatosensory cortex as it receives significantly more input from the thalamus, has neurons highly responsive to somatosensory stimuli, and can evoke somatic sensations through electrical stimulation. Areas 1 and 2 receive most of their input from area 3. The gustatory cortex is the primary receptive area for taste, or gustation. The gustatory cortex consists of two primary structures: the anterior insula, located on the insular lobe, and the frontal operculum, located on the frontal lobe. Similarly to the olfactory cortex, the gustatory pathway operates through both peripheral and central mechanisms. Peripheral taste receptors, located on the tongue, soft palate, pharynx, and esophagus, transmit the received signal to primary sensory axons, where the signal is projected to the nucleus of the solitary tract in the medulla, or the gustatory nucleus of the solitary tract complex. The signal is then transmitted to the thalamus, which in turn projects the signal to several regions of the neocortex, including the gustatory cortex. A stimulus modality (sensory modality) is a type of physical phenomenon that can be sensed. Examples are temperature, taste, sound, and pressure. The type of sensory receptor activated by a stimulus plays the primary role in coding the stimulus modality. In the memory-prediction framework, Jeff Hawkins mentions a correspondence between the six layers of the cerebral cortex and the six layers of the optic tract of the visual system. The visual cortex has areas labelled V1, V2, V3, V4, V5, MT, IT, etc. 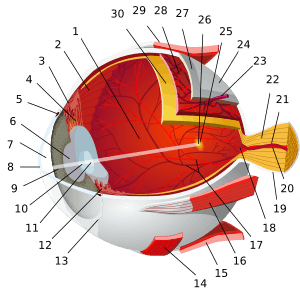 Thus Area V1 mentioned below, is meant to signify only one class of cells in the brain, for which there can be many other cells which are also engaged in vision. Visual Area 1, or V1, is used for vision, via the visual system to the primary visual cortex. The cones which are responsible for color vision. Auditory Area 1, or A1, is for hearing, via the auditory system, the primary auditory cortex. Somatosensory Area 1, or S1, is for touch and proprioception in the somatosensory system. The somatosensory system feeds the Brodmann Areas 3, 1 and 2 of the primary somatosensory cortex. But there are also pathways for proprioception (via the cerebellum), and motor control (via Brodmann area 4). See also: S2 Secondary somatosensory cortex. Gustatory Area 1, or G1, is used for taste. Taste does not refer to the flavor of food, because the flavor of the food refers to the odor. The five qualities of taste include sourness, bitterness, sweetness, saltiness, and a recently discovered protein taste quality called umami. Olfactory Area 1, or O1, is used for smell. 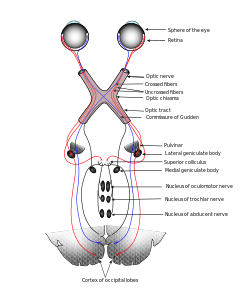 In contrast to vision and hearing, the olfactory bulbs are not cross-hemispheric; the right bulb connects to the right hemisphere and the left bulb connects to the left hemisphere. 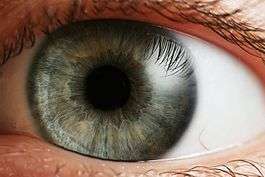 Visual system consists of the photoreceptor cells, optic nerve, and V1. Somatosensory system consists of the receptors, transmitters (pathways) leading to S1, and S1 that experiences the sensations labelled as touch or pressure, temperature (warm or cold), pain (including itch and tickle), and the sensations of muscle movement and joint position including posture, movement, and facial expression (collectively also called proprioception). Wikimedia Commons has media related to Sensory systems.